Guest blogger Michael Wright highlights the story of an oddball Gretsch, designed by Jimmie Webster. Not a lot of people loved it at the time… but it was a visionary creation! History seems to go in cycles, it appears. Not perfect circles, but close enough. When it comes to guitars we seem to go through periods when guitar designers go nuts and start pushing the envelope with whacky shapes. Now, I’m one of that subset of guitar fans that’s always a sucker for really oddball guitars. I mean, Les Pauls are wonderful, but show me something straight out of the Jetsons like the Gretsch Astrojet and I’m hooked! 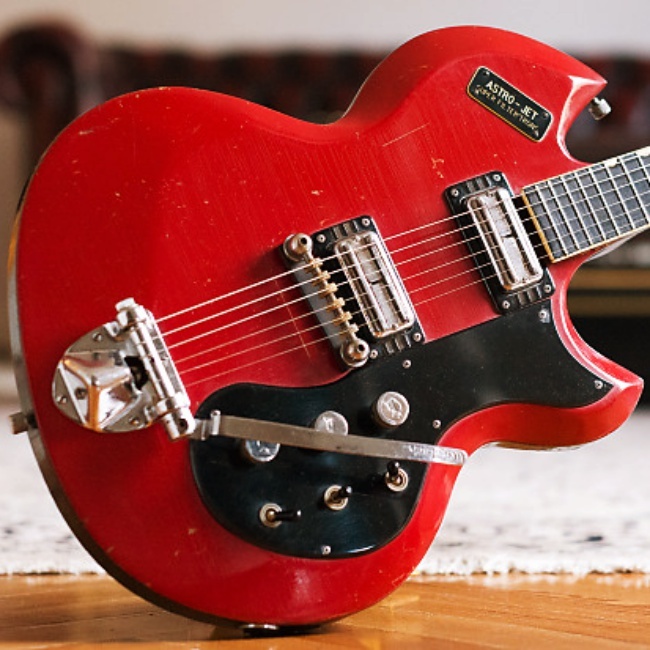 The Gretsch Astrojet is an artifact from the early 1960s. The music industry didn’t know it yet, but it was beginning to lose its grip at the time. Music has always been led by popular tastes, but the “product” was always fairly tightly controlled by managers, promoters, record companies, radio. When “folk music” hit big in the late 1950s it introduced a wild card: musicians from outside the “business.” Outsider art. Then came rock ‘n’ roll. Rock was fickle, unpredictable. Just what did those Baby Boomers want? Gretsch considered the same conundrum. Why don’t we ask Jimmie Webster? You youngsters may not know who Jimmie Webster was, but he was a great champion of “tapping” technique decades before Eddie Van Halen. Actually, Jimmie, born in Ohio, learned tapping from Harry DeArmond, the famous pickup manufacturer from Toledo who produced Gretsch’s pickups. Exactly what that transfer of knowledge was we don’t know, but Jimmie tapped. His “Webster’s Unabridged” album is one of the great guitar records. Anyhow, after the War Webster became a consultant for Gretsch and was hired to travel around the country demonstrating Gretsch electric guitars using his tapping technique. There’s a whole class of “tapping guitars” that derived from those workshops, including those of Dave Bunker, who’s produced Bunker guitars since the late 1960s (and the Ibanez USA guitars in the early ‘90s). 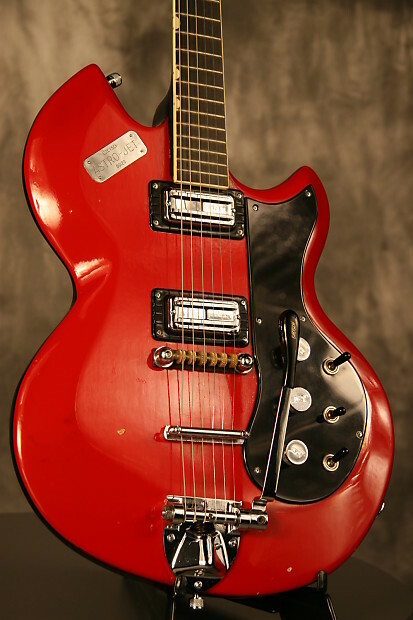 Gretsch asked Webster to come up with a guitar design that would appeal to the kids, and the result was the Astrojet, developed in 1964. What can you say? This was like Bizarro to Superman. I don’t know. I don’t find many guitars “ugly,” but this pretty much qualifies. The name undoubtedly came from the fascination with the Space Race at the time. The Telstar satellite had been launched in 1962. The Jetsons cartoon series debuted the next year. How about we call the new guitar the Astrojet? Actually, Gretsch put a lot of effort into the Astrojet. These had solid mahogany bodies with a set-in neck using Gretsch’s unique dowelled joints (that make them impossible to work on). The fingerboard is ebony. The pickups are high-end DeArmond Super Filter ‘Tron humbuckers. (High-output DiMarzio Super Distortions lay more than a decade in the future.) As you might expect from a guitar designed by a pro guitarist, the Astrojet has pretty interesting controls. The knobs are a master volume and two tone controls. The switches include a threeway select, a threeway tone selector, and (my favorite waste of space) a “standby” switch. The tone toggle let you choose different capacitors giving you a mid-bass range, a treble sound for lead, and a heavy bass tone. I guess if you had a “combo” of neatly coifed young men in matching Nehru jackets all playing matching Gretsch Astrojets and probably called the Supersonic Four Lads, this guitar might be a pretty cool part of the “look.” However, by 1965, the year this guitar hit the Gretsch catalog, the Beatles had let their hair begin to grow and they had shed the matching suits for more Bohemian leather jackets and turtlenecks (“Rubber Soul”), a harbinger of what was fast approaching. Hippies. Actually, it’s kind of ironic that the somewhat eclectic tastes of anti-establishment young folks didn’t embrace the rather radical design of the Astrojet. But I guess it was just too strained, too over the top. I’m not sure how long the Astrojet was offered but it was not in the 1968 catalog. I think that Astrojets are pretty rare. You just don’t see them come up for sale that often. The Gretsch Astrojet wasn’t the last odd guitar to appear, of course. There have always been guitar designers whose vision transcends popular tastes. Just think of the early 1980s when both Heavy Metal and New Wave players stumbled over each other to play exotic-shaped guitars. But Jimmy Webster’s visionary creation, however near-sighted, puts the Gretsch Astrojet in a class by itself.